Print the Paleo Calabaza Squash Pesto Pasta with Chicken recipe here! Welcome back from the weekend! I hope everyone had an enjoyable and relaxing one. Today I'm re-sharing a quick and easy recipe that' can be tweaked to accommodate your dietary guidelines. i.e. If you can eat cheese you can purchase pre-made pesto or if you have found a Paleo or Whole 30 friendly pre-made pesto you can use that as well. I'll be dabbling with new recipes to share soon, but while my schedule is beyond crazy busy, I figured I could keep re-sharing some recipes from my early blogging days. This one and next week's post will be green for St. Patrick's day! The menu (Paleo and Whole 30 friendly): Calabaza squash pesto "pasta" with sauteed chicken. Serving size: one, easily multiplied if cooking for more. Rinse the arugula, basil, and parsley and pat them dry. Remove any stems. Place the arugula, basil, Italian parsley, olive oil, garlic, and 1/2 tsp salt into a food processor. Puree the pesto mix until the consistency of your liking. You can taste test the pesto to see if you like the flavor here and make adjustments for whatever you think it needs: more garlic, more basil, more olive oil or salt... The pesto will make more than you need for this one meal, so let's all clap that you can use it over the next few days for things like your breakfast eggs or over any form of potato, etc. Thoroughly wash and dry the Calabaza squash (or whichever vegetable you decide to use). Cut off the ends of it to create a flat surface on each end. 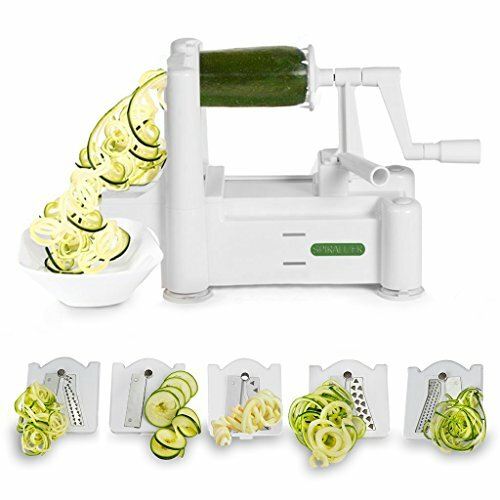 Place the squash into the Spiralizer. 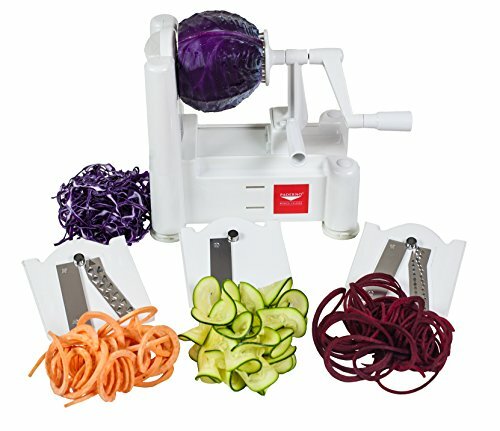 Using blade B (if you have the three blade Spiralizer), twirl the handle to create the pasta. You can switch out to any blade you'd like to create the "pasta" size you prefer. Set aside. 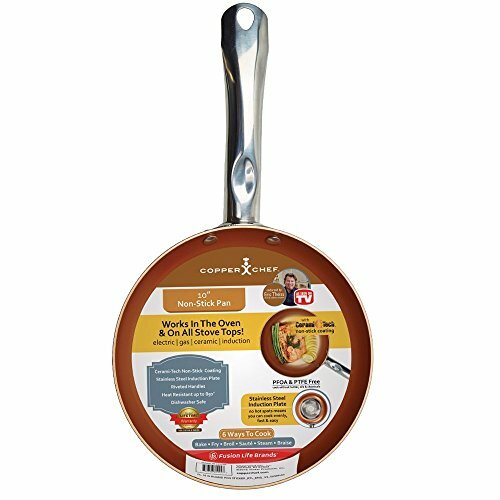 Slice the chicken breast into bite size pieces and transfer it to a non-stick pan or the Copper Chef pan over medium-high heat. Allow the chicken to cook for a few minutes, stirring occasionally. Add in the pesto sauce to the chicken while it is finishing cooking, another 2-5 minutes depending upon your stove. Make sure to check for any pink before serving or use a food thermometer. While the chicken is finishing cooking, add in the Calabaza squash "noodles" to the same saute pan and add more pesto to it. Stir it a few times to make sure the "noodles" heat up thoroughly before serving. Taste the dish before serving to make adjustments where needed, and IF* you're not restricted from cheese then you can sprinkle some Parmesan cheese over the top of the dish as well. **Ideas of things you can also add to your pesto: Parmesan cheese, pine nuts, broccoli, kale, spinach, walnuts, cashews, or cilantro. I hope you enjoyed this easy dinner idea. It's nothing very original but I find that sometimes I simply don't think about regular ol' dishes I love because I'm too curious to try new recipes. I'd love to hear of any pesto-making tricks you may have so please comment below if you'd like to share! You can find my previous recipes I've shared here. You can find all of my previous Paleo recipes here. You can also find my previous Whole 30 recipes here.